We have a module in an application where users define time periods for different criteria that will be used later to filter some lists. By default each criterion applies any time. Its validity can be limited by both restricting the time periods where it applies, and adding exclusion time periods. Already-defined periods of applying and excluding can be edited or deleted. Users find it difficult to understand the logic of "application" vs "exclusion" time periods, which I totally understand. I can't find a solution to simplify the interface while keeping all the existing possibilities. What can be done to improve the user's experience here? 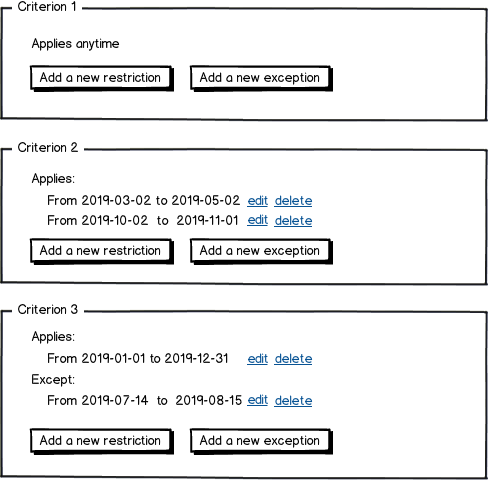 Try showing them visually, as they build the restriction and exemption times. With each criterion added, the timeline updates. I'm not sure I fully understand your use case, but it sounds like users need to clearly see the results of their restrictions and exceptions. I'm focusing a little bit on how to see the outcome as feedback. Forcing them to read and calculate dates (and proportional allocations) seems to add to their workload. They also might have to look at periods across each criterion as well. Could you have a visualization that aids in showing them as they add criteria? Github is an example of showing a years worth of data. At a glance, you can see periods of activity. Don't make them read; provide visuals in tandem. If there's another state (i'm not too clear on this): that of unrestricted and undeclared time, the heatmap can show these gaps as well. To allow insertion of an exception more easily, I would recommend a split (or similarly named) button (in addition to edit and delete), which would double the current line and prefill the start of the first and the end of the second line with the start and end of the original line. A color-coded calendar to help visualize this (as suggested in other answers) would certainly be helpful but is not strictly required. By the way, your example criterion 1 is simply the equivalent of Applies from -infinity to infinity. *) "Criteria" is the plural of "criterion" (a standard or a trait) or of "criterium" (a bike race). I apologize if I misunderstood the ASK, but I feel this is a classic case of AND & OR operations (kind of :P). 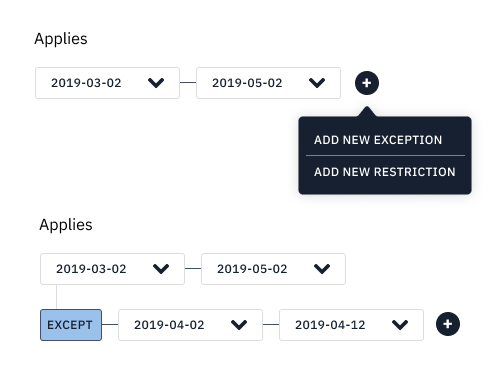 Users can add another rule on top of the above rule i.e Exception, which may or may not overlap with the set time period. Since the application and exception are closely tied to the mental map when creating, instead of giving them separate hierarchies I feel they should have parent/child relationship. I love how Zapier visualizes the AND/OR operations. Instead of placing action buttons at the bottom, place "Add" buttons in each section. 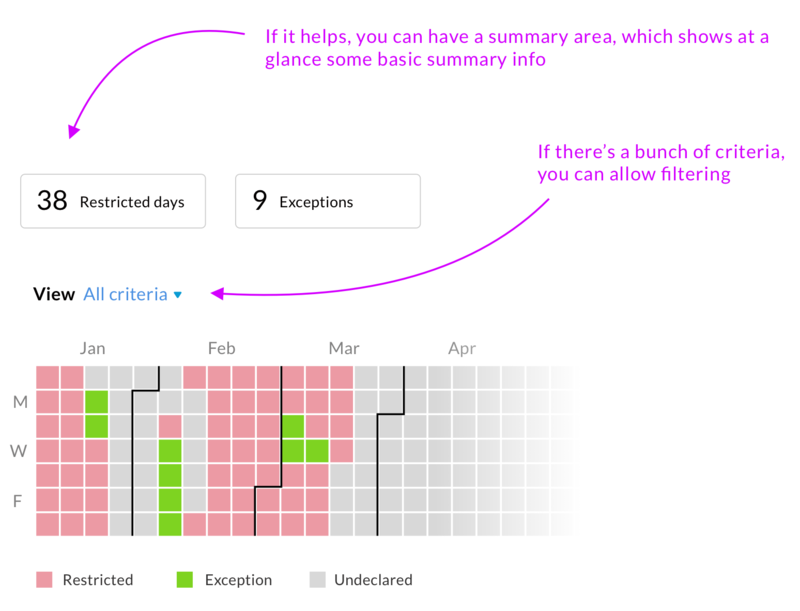 Usually simplifying the copy language helps (something like "add valid time range" & "block specific dates". A third option is to add an icon (+ for add, - for restricting). Best if you do all three together, this makes sure you cover more users' logics (i.e. graphic-oriented vs readers) Try to think of the user as if you were talking to a kid ;) this always helps me! The problem is that you are presenting the rules, but not the result. As a litmus test, try to answer the question: is the criterion applied on Mar 23rd? It could also be helpful to make this more visual. Calendars would be greatly helpful; especially with clicking to toggle on/off and SHIFT+click or CTRL+click to mass select/unselect. This order of magnitude check can help the user identifying typos. Not the answer you're looking for? Browse other questions tagged usability gui-design time simplicity or ask your own question. How to handle time input for different time zones?